Cleaning Services | Ashford Cleaning Contractors Ltd.
Our experienced team provide a full range cleaning services for industry and commercial clients. 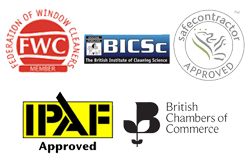 From window cleaning to office cleans, hygiene services to pest control – we do it all. Ashford Cleaning Contractors Limited offers a wide range of top quality cleaning chemicals and products at very low prices – with discounts given on bulk orders. We also offer a full range of consumable products, from various sizes and grades of toilet rolls, hand towels and soaps and related dispensers, to supplying and servicing dust control matting, feminine hygiene units, timer controlled-wall mounted fresh air sprays and roller towels. All these items and more at very low prices. Ashford Cleaning Contractors Limited can now offer Pest Control services to premises of all sizes. Being a local company we are able to supply these services at very reasonable rates. We pride ourselves at offering a high quality, reliable and very effective Pest Control Management at extremely competitive rates.